Approved Exam Preparation Provider for Financial Risk Manager (FRM) 2019 Certification Course. Financial Risk Manager (FRM) is the world's most highly valued accreditation for financial professionals who manage risk. FRM program is managed by Global Association of Risk Professionals (GARP, USA). FRM is also accountable to evaluate and take appropriate action to control risks that involves Inflation, Foreign exchange, Liquidity etc. This Online Training Course on Financial Risk Manager or FRM® Certification covers the syllabus prescribed by GARP for 2019 exams and is delivered by FinShastra, founded by Amit Parakh, a CA, FRM, CS and CFA holder and a renowned trainer for FRM and related Finance Courses. The FRM is a globally recognized yardstick certification program for financial risk managers and is the de-facto global qualification in the practice of Financial Risk Management. Ideally, FRM certification is for banking and finance specialists who are involved in analysing, controlling, or assessing potential credit, market, operational risks and anticipating various risks that the organization may be susceptible to in the process of growing and creating value. FRM is also accountable to evaluate and take appropriate action to control risks that involves Inflation, Foreign exchange, Volatility, Liquidity etc. The program is highly acclaimed due to the available number of job opportunities and lower fees for the course per se. FRM fees is much lower when compared to the fees of CFA and MBA. FRM certification helps you to scale the ladder and move ahead in the global job market. Certified FRMs have secured positions such as Chief Risk Officer, Senior Risk Analyst, Head of Operational Risk and Director of Risk Management and so on. In evidencing your skill and displaying better risk practices, you automatically enrol yourself to a world-wide community who are enthusiastic to improve financial stability. As the fiscal industry becomes progressively competitive and anxious about managing risk, it is imperative to engage yourself and your capabilities to add value to an organization. Possessing FRM certification indicates to employers that you are sincere about risk management and that you have had your Certification authenticated against international professional standards. By linking yourself to the FRM community, you become part of the elite group of accomplished professionals who are pursued after and employed by the leading financial institutions in the world. It has been observed that most people who participate in the program would endorse it to others to do the same. Professionals in the field of finance and having widespread knowledge about economy and finance can work as a Financial Risk Manager. Most of the reputed risk management firms give enormous value to a FRM qualified person. Therefore, FRM certification is a necessity for any aspiring Financial Risk Manager. The credential gives one an exhaustive understanding of world economy, financial markets, various risk models and much more. Although the certification gives demanding knowledge about risk management, one must be skilful of taking premeditated risks while working under tremendous pressure to flourish as a FRM professional. FRM certification is a highly sought-after testimonial throughout the world. While large-scale risk management firms continue to remain as major employers of FRM professionals, one can work as a freelancer too. Major corporations and investment bankers take FRM services from risk management firms, and some of them employs FRM professionals. A FRM certified professional can aim for positions such as Risk Quantification Manager, Credit risk specialist, Market risk specialist, Enterprise Risk Manager, Operational risk analysts, Regulatory risk analysts etc. The compensation and other perks for an FRM professional is usually high as it involves extensive traveling and working under pressure. The under-lying truth is It is a highly rewarding and satisfying career. FRM aspirant is offered a ‘FRM Charter’ upon completion of the course. There are over 26000 FRM charter holders across globe. The highlight of the FRM certification is that it gives you a distinctive advantage from the other risk professionals who are operative in money and investment turfs. FRM certification is of such high standards that every top employer recognizes and appreciates it. The skills that a FRM integrates are priceless and the FRM certification provides you with state of the art knowledge that is required in its field. The FRM certification gives you the opportunity to network with some of the experts in the market and expands opportunities in the world of finance. More than 30,000 individuals from 141 countries across the globe have passed the FRM Exam, automatically, empowering you to become part of the elite group. Employers around the world realize that the FRM Program prepares candidates with the specialized knowledge and skills necessary to succeed in the dynamic financial sector. The FRM designation is by far the best known and most respected designation for financial risk, with all the top 25 global banks having a significant presence of Certified FRMs in its organisation. There is no pre-qualification required to appear for the FRM Exam. Nevertheless, the FRM program is recommended to B.com, MBA, CFA, CA, CPA, and other finance professionals, as this program specializes into Risk Management. Even an undergraduate (Final Year of Graduation) is qualified to give the FRM exam. But you can take FRM Part 2 only when you complete the FRM Part 1. Candidates must pass both the parts one after another. Once you have passed the FRM Exam, you need to provide the proof of your professional experience to GARP to receive your certificate. The proof of professional experience should be furnished to GARP in about 5 years of time. Failure to do so, will result in you taking the exams once again. GARP, after processing your work experience, will mail the certificate to you. Very helpful. cost wise also very reasonable.Thanks to Apna course f & Amit sir. Good course. As with any course there are errors that I wish Apna would go back and fix/edit with just some typed comments at the bottom of the screen. Overall a nice dive into the material and feeling good about taking some practice exams soon. Very good instructor. Tries to give reasoning behind equations and formulas. A comprehensive course which makes the textbook easy to understand. Excellently explained. Almost all topics are covered. Very nice course offered by Apnacourse. Precise and to the point. Thank you so much. I would like to thank apnacourse for providing such online courses...good one.. All lectures are explained very nicely..!! Apnacourse has done a great job by publishing this course. This is what i was looking for. Good content. Nice course..! Excellent website.. liked the content..looking for still more courses of financial management.. I liked the training as well as the content. It was simple to understand. Contents were useful, gained lot of knowledge from this course. This course has been explained very well in apnacourse website. I suggest people to take this course. Even the contents are good. Excellent..
Well presented course. Its a great starting point. Solid content included.. Course was professional in content and delivery. Nice! Good..The material was presented with clarity..
Just can't say how much I appreciate Mr.Amit Parikh , all the topics are well taught, up to the point, I'm all ready for Nov!. Thanks so much. Saved my time as i am working and can't get the job done in 2 months only through only reading. Amit, an IIM Ahmedabad graduate is an avid trainer in the finance space. Having cracked CA (with an all India 14th rank), FRM, CS, CFA exams all in first attempt and being an Aditya Birla Scholarship nominee as one of the all India CAT toppers, he knows what it takes. He regularly conducts study programs related to CFA, FRM, CA and has conducted courses/workshops for IIM Shillong, XLRI, Praxis,Great Lakes, SREI, IFCI, ICICI Bank, NSE, Kotak Securities etc. 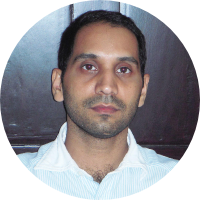 Amit has worked extensively in the banking and equity research areas before entering academics. He has been with Structured Products Group, ICICI Bank, where he played a key role in carrying out valuation assignments, building credit rating models and structuring transactions. He has also been an equity research analyst with JP Morgan where he was involved in building valuation models and financial analysis of Indian IT Services companies. He takes active interest in capital markets and specifically, likes to get involved in valuation assignments. He conducts workshops on corporate finance, asset valuation, risk management and financial analysis.